Ninety-four percent of federal candidates who signed the “No Fossil Fuel Money Pledge” lost in 2018. The pledge to reject coal, gas and oil company donations was put together by 16 environmental groups. Some pledge-signers are even personally invested in fossil fuel companies, including Exxon Mobil. The vast majority of candidates for federal office in the 2018 election cycle who pledged not to take fossil fuel industry campaign donations were defeated, according to data shared with The Daily Caller News Foundation. Out of the more than 430 federal office-seekers who signed the “No Fossil Fuel Money Pledge,” only 28 won, according to research by EPA shared with TheDCNF. These figures don’t include candidates for state or local offices. The “No Fossil Fuel Money Pledge” is a joint venture between 16 environmental groups, led by Oil Change U.S., that are part of the “keep it in the ground” movement to get rid of coal, gas and oil. So far, more than 1,300 candidates and elected officials signed on since 2017. That includes state and local candidates and officials. 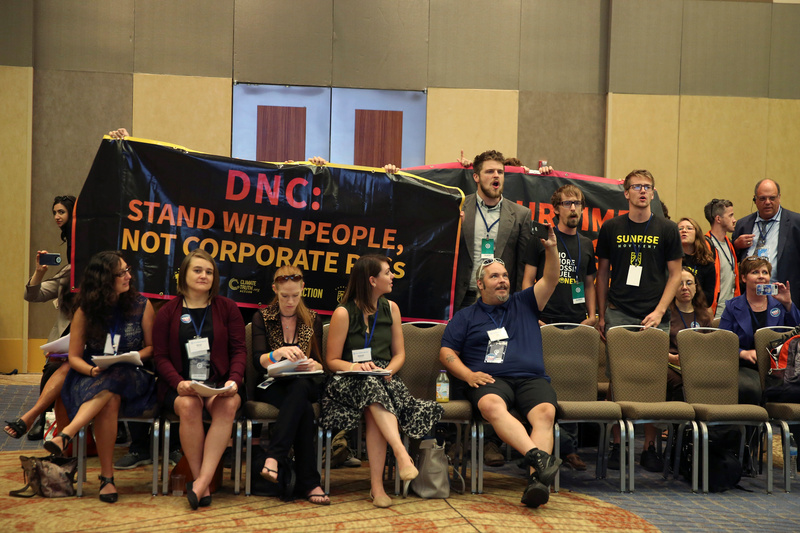 Environmentalists have increasingly agitated for Democrats to forgo taking fossil fuel industry money, and the Democratic National Committee initially endorsed such a ban in June 2018. However, the DNC walked back that prohibition in August 2018 by allowing candidates to accept donations from energy company employees. Most “No Fossil Fuel Money Pledge” signatories were Democrats, though some Republicans and Libertarians also signed on. Notable signatories include freshman Democratic lawmakers Alexandria Ocasio-Cortez of New York, Ilhan Omar of Minnesota and Deb Haaland of New Mexico. Other notables include California Rep. Ro Khanna and Hawaii Rep. Tulsi Gabbard, who recently announced she would run for president in 2020. Out of the 28 candidates who signed the anti-fossil fuel pledge, 13 were incumbents, according to EPA’s figures. In total, just 6 percent of pledge-signers seeking federal office won, opposed to 94 percent who lost. “Affordable, domestically produced gas and other energy is part of a winning economy, and politicians stand in the way of American energy independence at their own peril,” Coggin said. Oil Change did not respond to TheDCNF’s request for comment, but the group previously celebrated the results of the 2018 election, which saw Democrats retake the House. 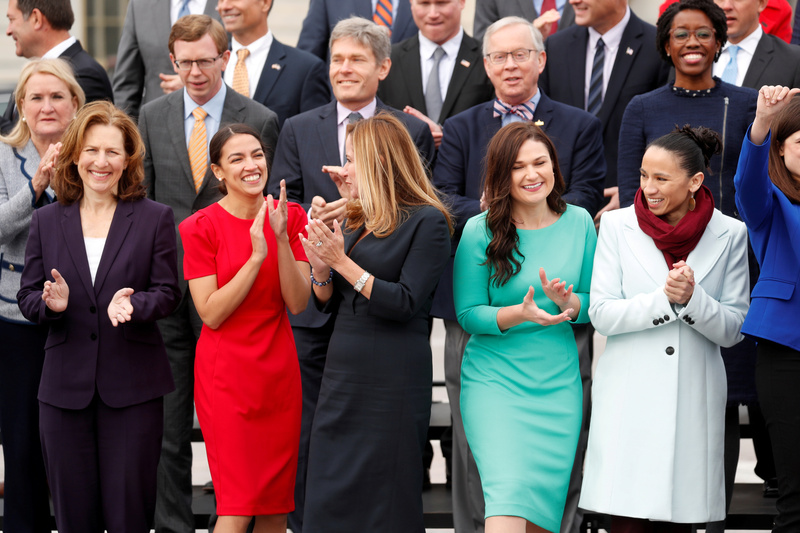 Female Democratic Representatives-elect (L-R) Kim Schrier of Washington, Alexandria Ocasio-Cortez of New York, Debbie Mucarsel-Powell of Florida, Abby Finkenauer of Iowa and Sharice Davids of Kansas pose together in the front row during a class picture with incoming newly elected members of the U.S. House of Representatives on Capitol Hill in Washington, U.S., November 14, 2018. REUTERS/Kevin Lamarque. Eleven of the 33 new Democrats elected to seats once held by Republicans signed the Oil Change’s pledge, Kretzmann said. However, Kretzmann did not address reports that a handful of prominent pledge-signers were personally invested in coal, oil and natural gas companies. Khanna, for example, has millions invested in companies such as Chevron Corp. and Exxon Mobil through his wife, Ritu. Likewise, Democrat Beto O’Rourke was removed from the list of pledge signatories in December when it was discovered he had actually taken campaign contributions from oil and gas industry executives. Some of the Oil Change pledge signatories also signed sister pledges to reject fossil fuel industry dollars, including one by the left-wing group Activate Virginia. 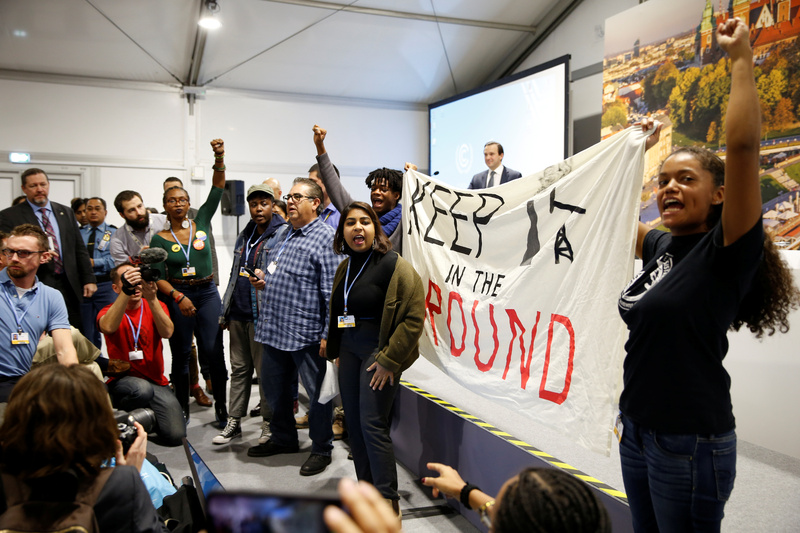 Environmental activists protest against fossil fuel during U.S. panel at the COP24 UN Climate Change Conference 2018 in Katowice, Poland December 10, 2018. Agencja Gazeta/Grzegorz Celejewski via REUTERS. “The point of signing our pledge is not to win any given election – it’s to change the political culture, in our case, within the Democratic Party of Virginia,” Josh Stanfield, the group’s executive director, told TheDCNF. Activate Virginia pledge-signers won in two “competitive” congressional districts, Stanfield said, referring to Virginia’s 2nd and 10th Congressional Districts. “Again — we’re not concerned about win metrics, but if we were, primary win metrics would probably be more insightful for us than those from the general,” Stanfield said.